Global oil supply growth is plunging as an extended period of low prices takes its toll, the International Energy Agency (IEA) said in its annual Medium-Term Oil Market Report (MTOMR) just released. While U.S. light, tight oil (LTO) output is falling steeply for now, the market will begin rebalancing in 2017 – and by 2021 the United States and Iran are seen leading production gains among non-OPEC and OPEC countries, respectively. The report notes that while oil prices should start to rise gradually once the market begins rebalancing, the availability of resources that can be easily and quickly tapped will limit the scope of rallies – at least in the near term. However, the report points to the risk of an oil price spike in the later part of the outlook period arising from insufficient investment. “It is easy for consumers to be lulled into complacency by ample stocks and low prices today, but they should heed the writing on the wall: the historic investment cuts we are seeing raise the odds of unpleasant oil-security surprises in the not-too-distant-future,” said IEA Executive Director Fatih Birol, launching the report at IHS CERAWeek. The report sees 4.1 million barrels a day (mb/d) being added to global oil supply between 2015 and 2021, down sharply from the total growth of 11 mb/d in the period 2009-2015. The drop in supply growth comes as upstream investment dries up in response to the current glut that is pressuring prices. Global oil exploration and production capital expenditures (capex) are expected to fall 17% in 2016, following a 24% cut in 2015 – which would be the first time since 1986 that upstream investment has fallen for two consecutive years. US production is seen reaching an all-time high of 14.2 mb/d by the end of the forecast period, but only after falling in the short term. LTO output declines by 0.6 mb/d this year and by a further 0.2 mb/d in 2017 before a gradual recovery in oil prices, combined with further improvements in operational efficiencies and cost cutting, allows production to resume its upward climb. The United States remains the largest contributor to supply growth during the forecast period, accounting for more than two-thirds of the net non-OPEC increase. Freed from sanctions, Iran leads OPEC gains: Iranian oil output rises 1 mb/d to 3.9 mb/d by 2021. The report sees global oil demand growing at an average rate of 1.2 mb/d through 2021, crossing the symbolic 100 mb/d mark towards the end of the decade before reaching 101.6 mb/d by 2021. Indian consumption races ahead as more motorists take to the roads, while Chinese demand growth cools in tandem with the economy. Global oil trade continues its pivot towards Asia. 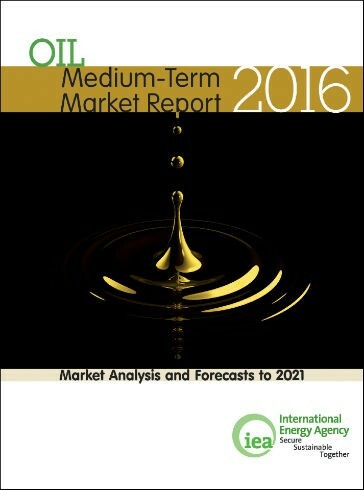 The Medium Term Oil Market Report 2016 is on sale at the IEA bookshop. Download the Overview here.